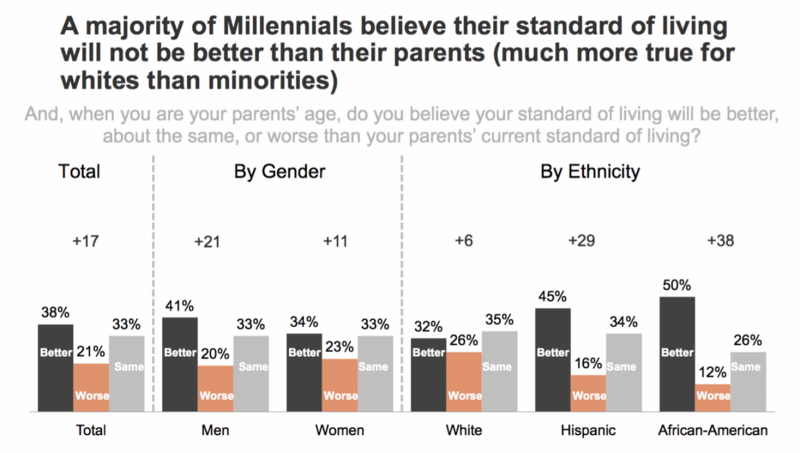 Millennials are certainly diverse, and they tend to be socially liberal. But a new nationwide poll carried out by EY, a professional services company, and the Economic Innovation Group, a policy and advocacy group, suggests that the generation of Americans who are now between the age of 18 and 34 really are not that entrepreneurial — a finding that is troubling for the future of the U.S. economy. In fact, a plurality of the 1,200 millennials surveyed — 44 percent of them — said that they think the best way to advance in their career is to stay with one company. 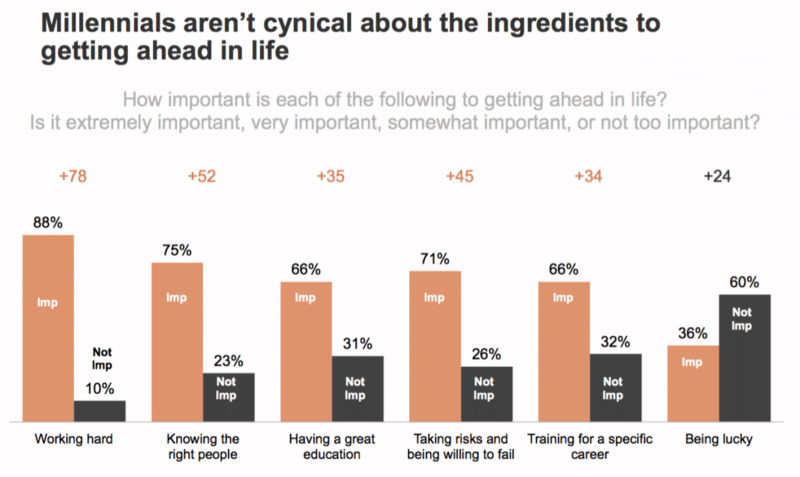 Twenty-five percent said moving from job to job at different companies was the best way, and 22 percent said starting your own company was the best plan. Among all racial and gender groups, black women were the only ones who thought starting a company was the best path to success. “Millennials are on track to be the least entrepreneurial generation on record, and that has huge implications for our economy going forward,” said John Lettieri, co-founder and senior director for policy and strategy at EIG. In an interview, Lettieri and others from EY and EIG pointed out that, unfortunately, the millennials who chose the one-company career path are probably wrong. It’s widely acknowledged that moving from job to job at different companies tends to be an easier way to move up the corporate ladder today than staying with one company. Survey data suggest that millennials might also be unaware of their own lack of entrepreneurship. In the poll, 72 percent of the millennials agreed that entrepreneurship and start-ups are essential to the national economy. They overwhelmingly described working for a start-up as a sign of success. 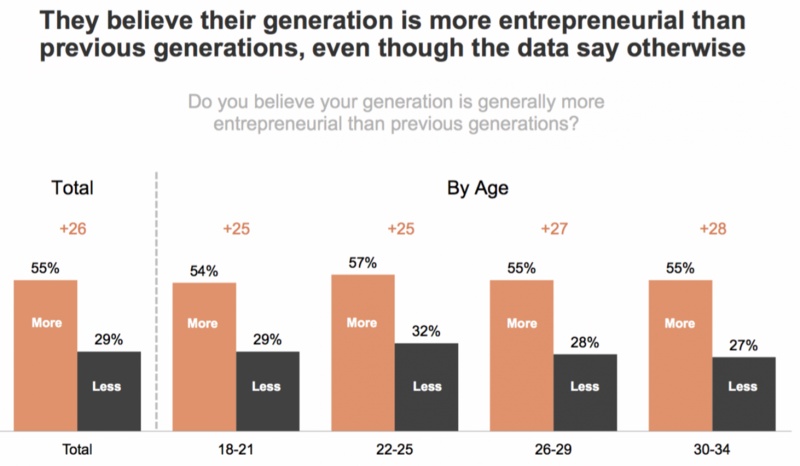 They also described their generation as more entrepreneurial than previous generations — but the data suggest otherwise. “When you’re pessimistic and distrustful as a generation, you tend to do things that make you poorer as an economy. Choosing those risk-averse paths, because they’re the ones with potentially the least downside, also caps your ability to grow,” Lettieri says. 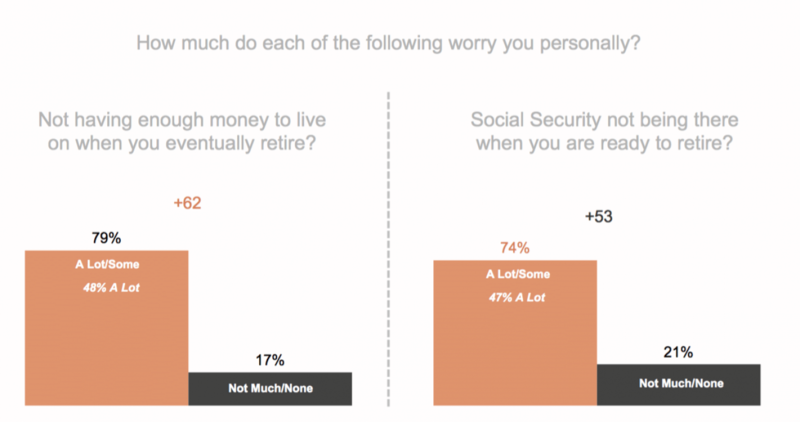 Sadly, most millennials now think their standard of living will not be better than their parents'. Whites are most likely to agree with that statement, with about half of African Americans and 45 percent of Hispanics saying their living standard will be better.